One friend of ours has a set of shamrock cookie cutters, and makes shamrock shortbread every St. Patrick’s Day. 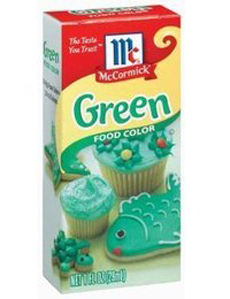 She tops them with green and/or white royal icing, and an assortment of green glitter and sprinkles. While we love shortbread, we take the easier way out. Here are two recipes that will make you extremely popular with friends, family and co-workers on St. Patrick’s Day. 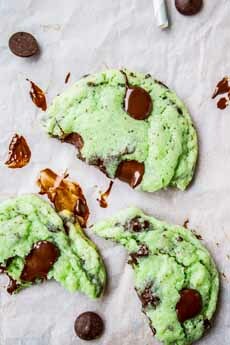 Note that if you don’t like mint, you can make green chocolate chip cookies simply by substituting the peppermint extract for vanilla extract. If you’re using another chocolate chip cookie recipe, make sure it is one with white sugar only. The classic Toll House Cookie recipe, for example, uses equal parts white and brown sugar, and brown sugar makes the cookie dough darker. We prefer this type of St. Pat’s chocolate chip cookie to another popular recipe, a dark chocolate cookie with green baking chips. Although tasty, the baking chips aren’t real chocolate, i.e., they aren’t white chocolate tinted green and flavored with mint. 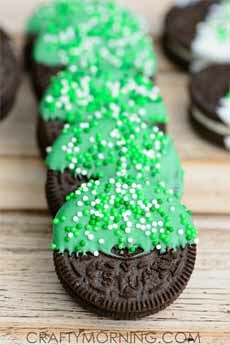 America’s favorite cookie, dressed up for St. Patrick’s Day (photo and recipe courtesy The Food Charlatan). Green food coloring can turn food into St.Pat’s fare, from morning yogurt to garnishes like sour cream and whipped cream. 1. PREHEAT the oven to 350°F. Line one or more baking sheets with parchment paper or a silicone baking mat. 2. BEAT the butter and sugar together in a large bowl or stand mixer. Scrape the sides and bottom of the bowl, then beat on medium for about 2 minutes, or until light and fluffy. Add the eggs and extra yolk, peppermint extract and food coloring, and blend. 3. COMBINE the flour, baking powder, baking soda, cream of tartar and salt in a separate bowl. Add to the wet ingredients and combine until the flour is not quite incorporated. 4. ADD half of the chocolate chips to the dough. * Chop the other half coarsely, with a knife or in a food processor. Add the chopped chocolate to the dough, and mix until just combined. This creates more of a distribution of chocolate throughout the dough; but you can keep all the chips whole. 5. COVER the dough and refrigerate for about an hour. Note that chilling is not mandatory, but Karen tried the recipe both ways, and prefers the texture and flavor that chilling creates. 6. USE a 2-inch cookie scoop to form balls of dough and drop them on the cookie sheet. These are very large cookies, and fit 8 cookies per pan. Alternatively, use a teaspoon or smaller scoop to drop smaller cookies. 7. BAKE for 8-10 minutes, or until the cookies barely start to brown on the edges (you want the cookies to be green, not browned). Let them cool for 5 minutes in the pan, then remove to a cooling rack. When cool, serve or store in an airtight container. NIBBLE TIP: For a yumilicious dessert, prepare the cookie dough in advance and refrigerate. Half an hour before dessert, scoop it onto the cookie sheets and bake. The result: warm, gooey chocolate chip cookies to serve alone or with vanilla or chocolate ice cream. Green-dipped Oreos from Crafty Morning. Double Stuf Oreos (photo courtesy Nabisco). Green white chocolate, the real deal, from Merckens. This recipe comes from Michelle of Crafty Morning. 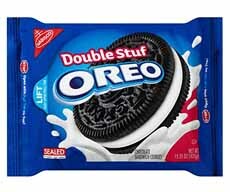 The original recipe uses Double Stuf Oreos (that’s how they spell it). 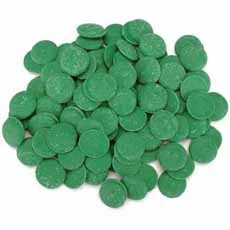 If you want mint flavor, you can use Mint Oreos (with a green center) and/or add peppermint extract to the candy melts (here’s how). Michelle’s original recipe uses half green, half white, candy melts, so that half of the cookies are dipped in green and half are dipped in white. We went all-green for St. Pat’s. As a substitute for the green chocolate melts, you can melt regular white chocolate and tint it green with food coloring. 1. MELT the chocolate/melts in a microwave safe bowl for 30 seconds at a time until it is melted. 2. DIP each cookie halfway into the chocolate and lay it on a sheet of wax or parchment paper. Shake the sprinkles onto the cookies while the chocolate is still warm. Let them harden for 20 minutes. 3. REMOVE the cookies from the paper and serve or store. *Spooned means exactly what is sounds like: You spoon the flour into the measuring cup and then level it off. If you scoop it by dipping a measuring cup into the canister, the pressure compacts more flour into the measuring cup. †Karen reserved 1/3 cup of the whole chips and pushed them into the tops of the baked cookies immediately after taking them out of the oven. This creates more “chip appeal” on the surface. ‡Merckens, a top-quality supplier to chocolatiers, actually sells real white chocolate tinted green! Candy Melts are made without cocoa butter, substituting vegetable oil. This makes them confectioner’s coating or imitation chocolate, not real chocolate. Note that for many years, a product called confectioner’s coating—imitation white chocolate made with vegetable oil instead of cocoa butter—was widely believed to be white chocolate. It is not, and doesn’t taste anywhere as good. White chocolate has cocoa butter, and is defined as white chocolate by the FDA.